I received an audiobook copy for my stop on the blog tour atDonnie Darko Girl. Crossing the Ice is a book I've been wanting to read for a while now, and so I jumped at the chance to review the audiobook. I don't have much experience with audiobooks - I borrowed one from the library quite a while ago and didn't like it. But listening to Crossing the Ice was a completely different experience and has made me a fan of audiobooks forever. The narrator, Emily Stokes, has a pleasant voice, and it was easy to allow her to draw me into the story immediately. I'd listen to any book narrated by her. The only teeny tiny issue I had was the toddler voices. It was slightly jarring to me but didn't take away from my love for this book at all. Crossing the Ice starts off rocky for Courtney and her skating partner, Mark. Things look bleak for them when they bomb in the free skate, and then they find out their coaches, Em and Sergei, will also be coaching their biggest rivals - Josh and his sister, Stephanie. It felt like a betrayal, and I'm still scratching my head over what the coaches were thinking with that decision. Anyway, I liked Josh from the start once he was away from his stuck up sister. There's so much about him to love. One of his favorite bands is Muse, so when I heard that, I knew I was in love! It was cute how nervous he was around Courtney. I thought he was simply adorable. And there's a moment when U2's "Love is Blindness" plays as Josh and Courtney are both skating that I held onto because it was too sweet. I think there was a hidden message from Em in playing that song - it was perfect. Stephanie is a terrible person and easy to root against. She's so bitchy and stuck up. I love how Courtney tells her off from time to time - it's nice to see a young woman stand up for herself. It's hard to believe she's Josh's sister! 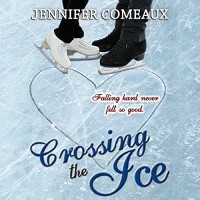 Crossing the Ice is a sweet love story with all the ups and downs of young love. I ADORE this book, and I was so sad when it was over. I'm planning on listening to it all over again very soon, plus I bought a copy of the book to read. Five stars from me, hands down!